Tucson, Az. 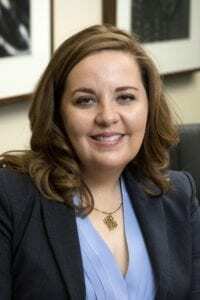 – DeConcini McDonald Yetwin & Lacy, P.C., one of southern Arizona’s oldest and largest law firms, is growing its law practice with the addition of associate attorney Zelma Letarte to its Tucson office. Letarte focuses her practice in family law. She joins the firm with substantial experience litigating in domestic relations matters including actions for dissolutions, legal separation, paternity and all post decree matters. She has extensive trial and hearing experience in both pre decree and post decree matters involving legal decision making disputes, parenting time disputes, spousal maintenance requests, asset allocation, debt distribution, and orders of protection and contempt actions. Letarte is involved in the community as an active volunteer of Southern Arizona Legal Aid. She is a member of the State Bar of Arizona and the Pima County Bar Association. She is the recipient of the 2016 American Institute of Family Law Attorneys Client Satisfaction Award, and previous recipient of the Arizona Family Support Council, Attorney of the Year (2009). She holds a J.D. from University of Dayton, and a B.A. from Northern Arizona University.